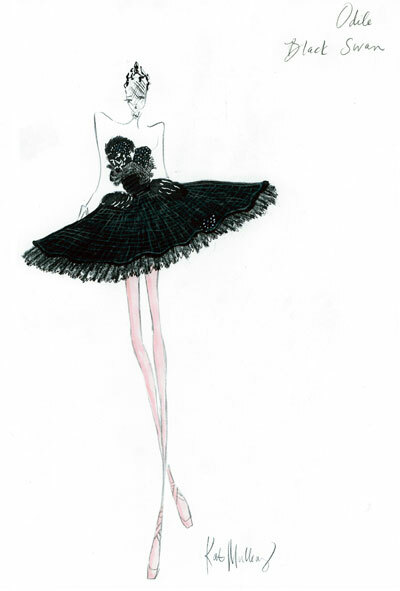 In many ways, Black Swan was a dream project for Rodarte. For starters, they’re movie buffs. “Our first relationship to clothing didn’t come from what our mom was wearing,” says Laura Mulleavy, speaking for the pair, “It came from film.” Famously, Mrs. Mulleavy, whose maiden name is Rodarte, let her daughters play hooky so that she could give them another kind of education. “We watched The Philadephia Story, The Thin Man films, and anything with Cary Grant. She just thought it would be fun for us,” Laura recalls. As they got older, the girls expanded their love for old Hollywood films to foreign and horror flicks. Early Rodarte collections demonstrate these contrasting influences—one season they sent romantic, ethereal gowns down the runway, and the next, they slashed the gowns to pieces and soaked them in red-dye for a decidedly bloody effect. When asked to name her favorite film costumes, Laura cites Gone With the Wind, Star Wars, and Hellraiser, in one breath. In the end, the intense pressure yielded inventive results. With the advice of choreographer (and now Portman fiance) Benjamin Millepied, the Mulleavys tweaked their designs to suit the dancers’ needs. For the characters Rothbart and the Black Swan’s metal headpieces, the designers worked with burnt copper. “It’s lightweight, so the dancer can support it, but it still has the power of metal. When you see it in real life, it looks really heavy,” says Laura of the deceptive crown. There was also the tricky matter of designing a gown for the gala in the film that was cut low enough in front to satisfy a body-conscious ballerina—but high enough in back to cover Nina’s self-mutilated shoulder blades. “Because I design women’s wear, I know it’s difficult to make a beautiful back on a dress with a low-cut front. The question became, ‘How can you do that in a way that’s as delicate as possible?’” says Laura. The sisters’ clever solution is revealed when Nina’s overbearing mother (Barbara Hershey) helps her undress by detaching the gown’s shoulder-piece. Remarkably, its swooping neckline stays put. Given the encrusted costumes, the bejeweled headpieces, and the white feather cape (which didn’t make it to film), it may be surprising that Laura’s favorite piece was the gray practice tutu. Handed down from prima ballerina to prima ballerina, a practice tutu is intended to mimic the heft and shape of the pricey costume that will be worn in performance. In “Swan Lake,” the ballerina wears a pancake tutu that juts out from the body to show off the dancer’s legs, which is particularly important during Odile’s 32 fouettes. 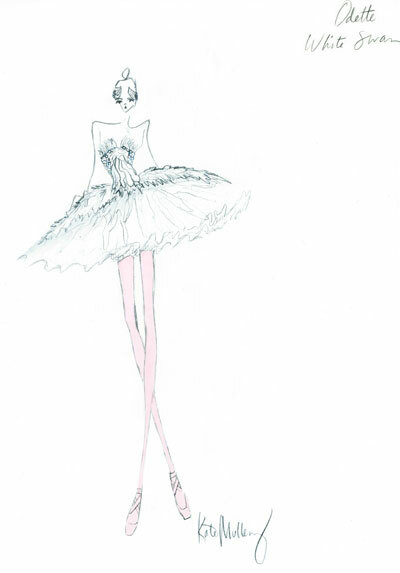 To design Nina’s practice tutu, the Mulleavys riffed on the ruined skirts of Degas’ bronze ballerina by layering scores of tulle in graduated colors, starting at the leg in pale, pointe-shoe pink. and progressing to darker and darker shades of gray. Yes, even the undersides of these costumes are stunning.